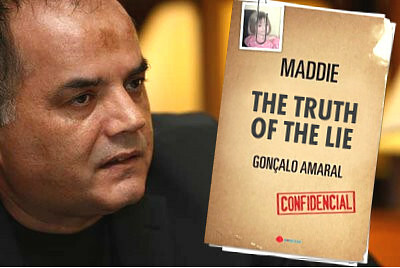 GONÇALO AMARAL - BRITISH MEDIA SMEAR CAMPAIGN: While The McCanns Pulled Off PR Stunts - Portuguese Police Accused Of Boozy Lunches In The Search For Madeleine By British Propaganda Reporting ! While The McCanns Pulled Off PR Stunts - Portuguese Police Accused Of Boozy Lunches In The Search For Madeleine By British Propaganda Reporting ! 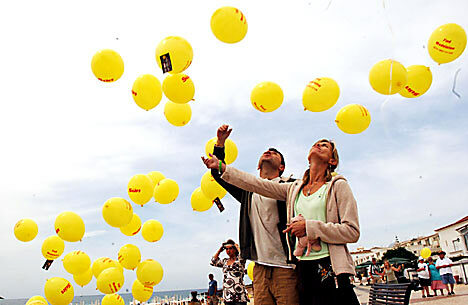 The latest development comes on the day Portuguese police were forced to defend their reputation amid allegations that they were enjoying boozy lunches while the search for Madeleine continued. Armed police officers were also criticised by Madeleine's aunt for preventing her from putting up posters of the little girl at Lisbon Airport. Senior police officers involved in the investigation were seen laughing and joking as images of the missing four-year-old and her desperate parents appeared on a restaurant TV screen. 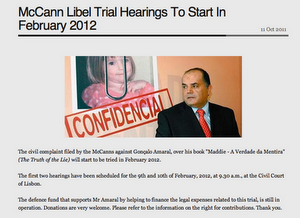 It happened at a lunch lasting nearly two hours as Kate and Gerry McCann were away campaigning in Europe. They laughed and cracked jokes as they enjoyed a meal washed down with wine and whisky - as footage of the couple played in the background. Afterwards, they left a table littered with empty glasses - and went back to work. Yesterday Policia Judiciara (PJ) spokesman Olegario Sousa, one of the officers spotted having lunch, said it was up to the individual to decide what he or she ate and drank. Asked if it was acceptable for police to drink alcohol in their lunch break he said: "I don't know, it is very, very sad but a person's free time is for lunch. That is normal to do. "The persons are in charge in the day, they are working in the day but they must eat and drink - it is normal. "I drink what I want to drink when I can drink." When it was put to him that he had been seen drinking, he said: "Have you seen anyone drunk? Have you seen any action deterred by that?" Mr Sousa and Goncalo Amaral, head of the regional PJ, were spotted as Kate and Gerry McCann travelled to Berlin and Amsterdam to appeal for more information about their missing daughter. In Portimao, a town near where the four-year-old was snatched 35 days ago, a diner at fish restaurant Carvi said he recognised the police officials. "I knew who they were because Mr Sousa has been all over the TV and in the papers," he said. The diner watched as officers enjoyed the lunch, which took place a short walk from the police station less than 24 hours after Kate and Gerry McCann were told that everything possible was being done to find their little girl.